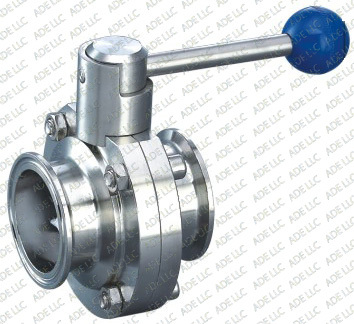 Our Tri-Clamp Butterfly Valves with pull handles, like the one shown above, are SS304 Stainless Steel. We have these Butterfly Valves in sizes from 1" to 4". View our catalog for more information and price listings for these Tri-Clamp Butterfly Valves and more. The picture left shows one of our 304 stainless Drain Valves with a 90° stainless down spout. These are not Tri-Clamp Valves. 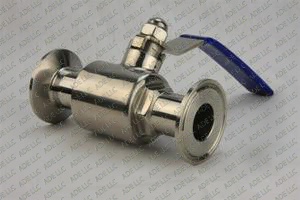 These valves attach to a ferrule with a threaded female fitting as shown in the picture above. The Weld On Ferrule and gasket come with the valve. We normally stock these Stainless Drain Valves in sizes from 1" to 4"
The picture located at the bottom left is a Tri-Clamp Ball Valve. These valves are also stainless steel and have tri-clamp ends. The picture located to the bottom right is also a Tri-Clamp Butterfly Valve.